You'll wonder why you don't do this more often - it's that much fun. It's time the kids tried their hand at pancake flipping (and chocolate chip smiley-face making). No need to rush through breakfast, Snowflake Lift is that close. You're a 4 minute drive from lively Main Street, Breckenridge. Take your mini-explorers out on the Spruce Creek Trail, an 11 minute drive away. Book a tee time at Breckenridge Golf Club, a 10 minute drive from the resort. Three short blocks from the shops and dining scene along historic Main Street, and across the street from Snowflake Chairlift and the Four O’Clock Run, ski-in/ski-out Wedgewood Lodge has the location angle covered. You’ll pick up on the family-owned-and-operated vibe from the moment you step inside the cozy lobby and check in. And your first tracks fans will appreciate the practically instant access to the lift – have them set their alarms accordingly, since you may not be up quite that early. Keep a stash of hand-warmers, mini trail maps and energy bars handy for stuffing into pockets on the way out the door – and plan a mid-morning meeting spot in advance. When everyone finally makes that last run down, they’ll be out of their snowsuits and into swimsuits faster than you can say, “Anyone up for the hot tub?” It’s conveniently indoors, so you don’t have to worry about making a mad dash through snow on the way to and from. Vacation residences are available in a variety of configurations, from studios to two-bedrooms (all with loft options), to a three-bedroom suite. Choose one that suits the size of your crew, so everyone gets to sleep in an actual bed and no one gets relegated to sleeping bags on the floor. Amenities vary unit to unit, some with fireplaces, full kitchens and a washer/dryer, while others stick to the essentials (beds, living space and kitchenette). If you’re not planning to do much cooking in, downtown dining options are an easy walk – ask the front desk for local favorites. 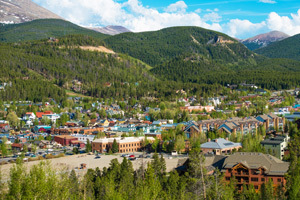 Rich with groomed blues, Breckenridge is ideal for skiers/snowboarders of all levels. Want to hit the bowls? Take the T-bar to the area south of Peak 9 and 10. Or visit nearby Keystone – it’s got a top-ranked terrain park, and the double-black Imperial Bowl is a favorite among the more adventuresome – you’ll earn your après ski drinks and then some. Downtown Breck has a 250-building historic district and nearly as many newly-built shops and restaurants. Spend a few afternoons or evenings rounding up souvenir t-shirts, sampling microbrews or checking out some of the galleries. Once the warmer months arrive, the Breck Summer Fun Park opens its rides, like the Gold Runner Coaster, Alpine SuperSlide, TenMile Flyer Zipline and Bungee Trampoline. Golfers will want to book a tee time at the 27-hole Breckenridge Golf Club, the only municipal course ever designed by Jack Nicklaus. - Front desk is open daily 8:00 AM-5:00 PM during summer months and 8:00 AM-8:00 PM during winter months. Guests that are planning to arrive after hours must contact the property in advance using information on the booking confirmation. the resort stuff will leave a package at the front desk with keys to the unit and check-in instructions. - This property is closed from 22 April 2019 to 07 June 2019 (dates subject to change). Guests will receive an email with special check-in instructions, directions, and parking information prior to their arrival. For more details, please contact the office using the information on the reservation confirmation received after booking. Guests will receive one onsite parking space per unit. For more details, please contact the office using the information on the reservation confirmation received after booking. Located at the base of the Tenmile Range of the Rocky Mountains and offering over 2,000 acres for skiing. The largest and oldest town in Summit County. Visit Main Street for restaurants that range from fast food to fine dining. There are several shops offering unique merchandise and souvenirs.